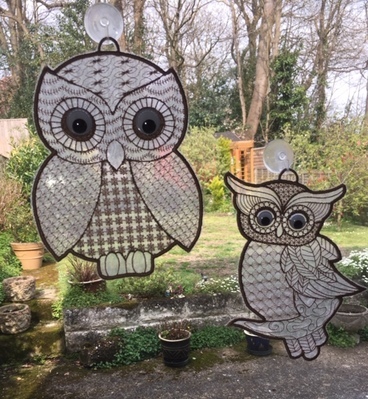 Dear Chris (pennifold) asked me to show a picture of my kitchen window with the two owls. As one can see the owls from the outside I have also attached the eyes on the back. Now they can look out at night!!! These are wonderful. I may need to do this to a few of mine. These are stunning! Love the "eye" idea! The owls are adorable. I love them and the work you did on them is beautiful. What a great way to dress up a window! Thanks, nice design and easy! Awesome, they look great on the window!! Love them!